In England there is that lovely idea of the dinner party, a mostly private affair held on special occasions and in the company of several people. 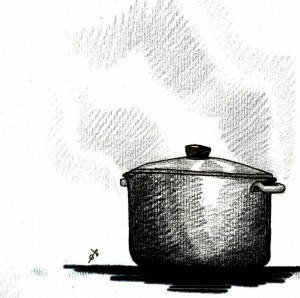 This idea has lent itself to both the title of this site and to my cookbook. Vegetarian Dinner Party is meant to make vegetarian and vegan cuisine viable for the everyday, and for more formal occasions as well. The 21 mouthwatering three-course menus complemented by wine matching, and instructions on how to prepare aperitivs will encourage anyone—friends and family, neighbors and acquaintances—to try vegetarian, vegan, or gluten free cooking. And teach you step by step how to make delicious and extraordinary dishes as well as a rich variety of easy-to-prepare options. For me, cooking, entertaining guests, and eating are relaxing and enjoyable, and count among the joys of life. Anyone wishing to find culinary inspiration can find it under recipes. For those who wish to broaden their knowledge of vegetarian cuisine, see under Cooking Classes. 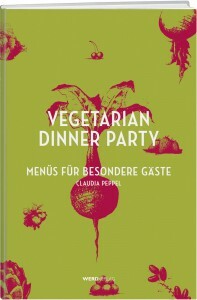 Vegetarian Dinner Party promotes meat-free nutrition and a changed way of life. To this end it advocates strict scrutiny of one’s own dealings with milk products, eggs, meat and fish, because the most sustainable animal welfare is practiced at the checkout line. Thus under press/links you will find articles and notes on my book as well as on vegetarian and vegan nutrition. Being a dinner guest who happens to be vegetarian or vegan is often felt as a complication. The same goes for many restaurants. It is tiresome to only ever find one or two vegetarian items to choose from on a menu. From a vegetarian and vegan point of view, Berlin is a true highlight among cities and has been recently nominated as vegetarian capital of the world. But once you are in Paris, Regensburg, Buenos Aires or Hong Kong, it becomes difficult, unless you opt for an Italian bistro—but who wants to always eat pizza or pasta? Vegetarian Dinner Party thus has a section out and about, where I report on my experiences here and abroad. Feel free to contact me any time for suggestions, requests, praise, criticism, questions about the recipes, recommendations for restaurants, or other advice. Vegetarische und vegane Gerichte für besondere Situationen: https://vegetariandinnerparty.de/en/about/. Viel Spaß und Guten Appetit beim kochen.